Today was the Culture Festival at our school. Here are some pictures. Here is the English Club. 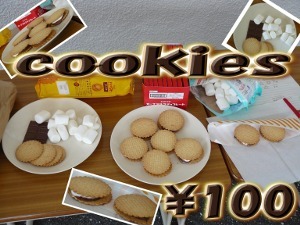 The English Club sold cookies. Here is our sign. Here is the English Club tent. I was really happy to see so many of my former students today. Brian and I enjoyed the Culture Festival! Here is a graduate who was in my 8th period NELP class last year. Wow! Time passes so quickly! I remember when she was in my junior high school first grade class! Here is a high school 3rd grade SELP student (who was my student in junior high first grade before we had a NELP program) and her older sister (who was in my high school English conversation class years ago). There's another sister who was also in my class, but unfortunately I didn't see her today! Here are some SELP students enjoying the Culture Festival. Here are the Junior High School First Grade NELP book reports displayed in their homeroom. Here are some of first graders with their friends. Here are the Junior High School Second Grade NELP book reports displayed in their homeroom. Here are some pictures of the second graders and their friends. Here are the Junior High School Third Grade NELP book reports displayed in the homeroom. Here are some pictures of the third graders and their friends at the Culture Festival. Here are some pictures of the high school NELP students at the culture festival. This was a busy week in NELP. Here are the latest pictures! The First Graders have started doing cooperative writing. This means that students show their writing to another student. They check each other's writing, give suggestions, and hopefully learn some new writing techniques from each other. Here are some pictures of the First Graders engaging in a discussion about their first reading. Their first reading was "The Wayfarer" by Stephen Crane, a part of his larger work "War is Kind". Here is a picture of the Second Graders during reading time. I don't have a picture of the Second Graders' discussion time, but their first reading was the poem "Opportunity" by Edward Rowland Sill. Here's this term's class picture of the Third Grade. Here the Third Graders are having a discussion about their first reading: "Ulysses" Alfred Lord Tennyson. This term, all three grades began doing formal debates. Here are a couple pictures of the First Graders preparing for their first debate. The First Graders' debate topic was "Should the Media Stop Reporting Negative News about the Government?" Here are pictures of the Second Graders preparing for their debate. The Second Graders' debate topic was "Should Young People Be Required to Give One Year of Compulsory Public Service in Japan?" Here are some pictures of the Third Graders preparing for their debate. The Third Graders' debate topic was "Should We Pass a Law Requiring Elderly People to Have Supervision or a Person Appointed to be Responsible for Them?"